I sat in a circle of women today with my jaw dropped completely open. It was the second time in as many weeks. Over the summer, the mother's group and the women's group at the church I attend have combined for a six week session to study Tim Keller's, The Prodigal God. To be honest, I was pretty turned off by it at first. The video we watched was overwhelmingly over produced and it was easy to toss this off as another marketing gimmick aimed at easy-to-forgive churches and their followers. However, the message in the sermon was thought provoking and I enjoy the snacks and camaraderie and discussion with other intelligent women so I decided to stick it out. And twice now, I have found my self with my mouth gaping wide open at the enormity of what we have just discussed; its newness and freshness for this Presbyterian it-is-what-it-has-always-been skeptic; and its truth for my life. "There was a man who had two sons. The younger one said to his father, 'Father, give me my share of the estate.' So he divided his property between them. Not long after that, the younger son got together all he had, set off for a distant country and there squandered his wealth in wild living. After he had spent everything, there was a severe famine in that whole country, and he began to be in need. So he went and hired himself out to a citizen of that country, who sent him to his fields to feed pigs. He longed to fill his stomach with the pods that the pigs were eating, but no one gave him anything." "When he came to his senses, he said, 'How many of my father's hired men have food to spare, and here I am starving to death! I will set out and go back to my father and say to him: Father, I have sinned against heaven and against you. I am no longer worthy to be called your son; make me like one of your hired men.' So he got up and went to his father." "But while he was still a long way off, his father saw him and was filled with compassion for him; he ran to his son, threw his arms around him and kissed him. The son said to him, 'Father, I have sinned against heaven and against you. I am no longer worthy to be called your son.' But the father said to his servants, 'Quick! Bring the best robe and put it on him. Put a ring on his finger and sandals on his feet. Bring the fattened calf and kill it. Let's have a feast and celebrate. For this son of mine was dead and is alive again; he was lost and is found.' So they began to celebrate." "Meanwhile, the older son was in the field. When he came near the house, he heard music and dancing. So he called one of the servants and asked him what was going on. 'Your brother has come,' he replied, 'and your father has killed the fattened calf because he has him back safe and sound.' The older brother became angry and refused to go in. So his father went out and pleaded with him. But he answered his father, 'Look! All these years I've been slaving for you and never disobeyed your orders. Yet you never gave me even a young goat so I could celebrate with my friends. But when this son of yours who has squandered your property with prostitutes comes home, you kill the fattened calf for him!'" "'My son,' the father said, 'you are always with me, and everything I have is yours. But we had to celebrate and be glad, because this brother of yours was dead and is alive again; he was lost and is found.'" The book is laid out in seven brief chapters which aim to uncover the extravagant (prodigal) grace of God, as revealed in this parable. Keller shows how the parable describes two kinds of "lost" people, not just one. Most people can identify the lostness of the "prodigal son," the younger brother in Jesus' story, who takes his inheritance early and squanders it on riotous living. But Keller shows that the "elder brother" in the parable is no less lost. Together, the two brothers are illustrations of two kinds of people in the world. "Jesus uses the younger and elder brothers to portray the two basic ways people try to find happiness and fulfillment: the way of moral conformity and the way of self-discovery." Both brothers are in the wrong, and when we see this, we discover a radical redefinition of what is wrong with us. "Nearly everyone defines sin as breaking a list of rules. Jesus, though, shows us that a man who has violated nothing on the list of moral misbehaviors may be every bit as spiritually lost as the most profligate, immoral person. Why? Because sin is not just breaking the rules, it is putting yourself in the place of God as Savior, Lord and Judge just as each son sought to displace the authority of the father in his own life." As these quotes hint, Keller's exposition of the two sons lays the groundwork for a penetrating analysis and critique of both moral relativists on the liberal left and religious moralists on the conservative right, showing that the latter are just as lost as the former. What both need is Jesus, whom Keller presents as "the true elder brother," the one who comes to our rescue at his own expense. Through his grace, we are given hope and invited to the great feast of the Father. 1) At our last session, I brought up my question concerning Keller's saying that we should not want the riches of heaven for the riches of heaven, but rather for the relationship with God. While I don't consider myself an 'Older Brother' type - one prone to wanting the riches of heaven but not the father - I had to pause when I considered what it was I wanted out of heaven. If I got to heaven and was for some reason disappointed, would I be angry with God? I don't have any expectations for good things to happen to me on this earth just because I am a Christian and because I have a personal relationship with God...but I do expect to go to heaven. And I don't keep up my relationship with God just to buy my ticket to heaven, my faith is more than that. But truthfully, I want to go to heaven. I've heard it's a really great place. So my jaw dropped when someone asked me WHY I wanted to go to heaven. Furthest from my mind was because I would be closer to God. I mean, somewhere in there I know the answer makes sense...but I never really thought about it before and it truly blew my mind. 2) After that mind-blowing experience I was excited to continue to read the book and looking forward to meeting with the women in my group again this morning. When discussing our initial thoughts of the next chapter, one of the women mentioned that Keller takes a lot of time in this chapter pointing out that religion is different than following Christ and she was interested in hearing our opinions on what that really meant, both for organized religions and for followers of Christ. We discussed Keller's concept that the elder brothers of the world are stuck trying to follow all of the rules to say they have checked off all the boxes, thus trying to take the control out of God's hands. There were many more beautiful discussions over the course of the morning and then the leader of our group shared something with us that truly amazed me. She shared with us something her husband, a pastor, had questioned her with. He asked her which came first. The 10 Commandments or Passover. Our study leader reminded us that Passover was when God delivered his people from Pharaoh as promised...it was not a coincidence that Jesus was crucified on Passover and thus all Christians were delivered from their sins. Turns out, the 10 Commandments came AFTER Passover. Meaning, that God delivered us before there were any rules to break. The rules all came after we were already absolved of all of our sins. So we follow the rules not SO we can be saved, but BECAUSE we were saved. She also pointed out that Christianity is the only religion in the world where this is true; that we are saved before we can even break the rules. Mind blowing stuff, huh. I just didn't expect my mind to be opened any further than it was. It isn't like I was sitting back self righteously thinking that I was better than everyone and didn't need to learn anything new...I just very humbly didn't think there WAS much more to learn. Having grown up in the church, had my own 'younger brother' pilgrimage in my early twenties and the opportunity to come back to God, I didn't think there was that much ground-breaking, mind-blowing, jaw-dropping stuff left. But His word is living and thus it grows. Enough to even wake up the sleepiest believer. So what are your thoughts on God? isn't it amazing how we don't come to the Word with expectations that it will change us, and it still does! We have a God of grace. 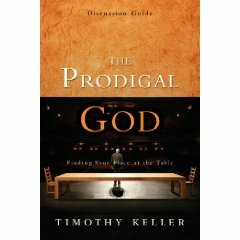 Tim Keller has a lot of great, helpful stuff! Have you ever read Beth Moore? That's great women's bible study material! What an awesome post! Thank you for sharing. I haven't read any of Tim Keller, but I think I'll put this book on my to-read list. The Prodigal Son is one of those stories I have a love/hate relationship with. I hate it because I feel like it's so OVER used, and because (thankfully) I've never had a wild younger-son season in my life. I love it because most of the time I see something new and beautiful in the story whenever it is presented fresh. I have many more older-son tendencies than I care to admit, and hearing a new perspective on the story often helps me get my heart back where it should be. I love how God surprises us by revealing more and more of himself to us when we least expect it. Makes me want to cry out "Forgive my unbelief! (and arrogancy!)" I love Tim Keller — I've been to Redeemer Presbyterian Church (where he preaches) several times and he's simply amazing! We're currently attending a church that Redeemer "planted" (it's more convenient to where we live) and so this post really hit home for me. 1.) The #1 reason I look forward to heaven is to actually be in God's presence. There have been a few times in my life where I really felt especially blessed and touched by God, to the point where I got choked up, couldn't talk, and just literally wept. I believe that the emotional intensity of those moments (knowing that I lack so much but at the same time, feeling such LOVE) is only a fraction of what I feel experience in heaven, and I truly, deeply look forward to it! This is, of course, in ADDITION to all the other benefits of heaven. Like being without all the evils of this physical world. Or even walking side-by-side with Biblical characters and being able to converse with them and ask them questions! I think that I would squeal like a teeny-bopper seeing Justin Bieber when I encounter all these men and women! 2.) I have never considered this question, but after reading what you wrote, its implications really hit me and I'm SOOO happy you shared it. Thank you! WOW. I've grown up in the church my whole life as well. However, my family moved across the country during my "vulnerable faith" period, as I refer to it, and I have been participating, but not knowing until recently. Ever since I've gotten married I have been amazed at what God has revealed to me. I have been thinking about the same things as you--especially the 10 commandments or passover first. One of my biggest frustrations with many religions (or all, in a way, maybe) is that there are sets of rules to follow, and one can't be accepted, or worthy, or saved, or go to heaven without following those rules, and it drives me nuts!! I just want to shake people and say to them "Don't you get it???! The reason we have grace is because we CAN'T follow the rules, no matter how we try." Great post. 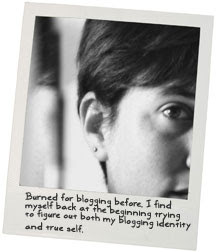 I read your blog consistently, but this is my first comment.